The national telecoms regulator has today proposed a series of options for how a new legally-binding 10Mbps broadband Universal Service Obligation (USO) could be rolled out across the United Kingdom by 2020, but it’s expensive and the final decision is down to the Government. According to today’s other Connected Nations 2016 report from Ofcom, around 8% of UK premises (2.4 million) in 2015 were unable to receive broadband speeds faster than 10Mbps, but thanks to on-going improvements this has now dropped to 5% (1.4 million premises) and those may fall within the Government’s planned Universal Service Obligation (USO). However it’s widely expected that fixed line “superfast broadband” (24Mbps+) connections should be able to reach 97-98% of premises by 2019 (it’s 91% today), which leaves around 3% of homes and businesses to suffer from slower connectivity (this usually reflects remote rural areas, although some urban locations will also fall into the same category). Catering for the final 3% by delivering truly universal fixed line superfast broadband coverage would be very expensive and so the cash-strapped Government has instead proposed a USO to fill the gap, which promises an “affordable” connection that can deliver Internet speeds of at least 10Mbps (Megabits per second). In fairness a legally-binding USO, which has to be supported by legislation through the new Digital Economy Bill 2016-17, is a significantly tougher pledge than the 24Mbps+ “superfast” target that is merely a non-binding commitment. Indeed other EU countries that have adopted such a USO do not go as far (e.g. Spain, Belgium and Croatia use 1Mbps, while Finland opted for 2Mbps and Malta is on 4Mbps). Earlier this year Ofcom were handed the task of examining the various technical options for service delivery of the USO (here) and the regulator has today proposed a mix of solutions. But first it’s important to understand how the existing and incredibly out-of-date USO works. The current USO is delivered exclusively via fixed line connections and only requires KCOM (Hull only) or Openreach (BT) to deliver, following the “reasonable request of any End-user” (i.e. demand-led), a telephone service that includes the ability to offer “data rates that are sufficient to permit functional internet access” (here); this can easily be met by a slow dial-up connection. On top of that the USO also sets a cost threshold of £3,400 (i.e. how much BT or KCOM must commit to ensure they deliver the service to an end-user). In practice most households will only ever pay a small connection charge to BT or KCOM of up to around £130 for a new service, but some premises may actually cost more than £3,400 to connect and at that point the end-user themselves could become liable for hefty Excess Construction Charges (ECC). As ever the main challenge with any USO is one of cost. Put another way, if the USO had no cost cap then somebody could build a small house on top of a mountain and expect the responsible operator to connect them up for almost nothing, even if it might cost the operator hundreds of thousands of pounds to do so. This would not be viable. Ofcom’s original “indicative estimate” for the cost of the existing USO to BT is said to be around £50-70m, although they also suggested that the benefits equated to about £60m. As a result the current USO approach is not believed to place an undue financial burden on BT or KCOM, but jumping to a 10Mbps USO via fixed lines could be a much more expensive upgrade. 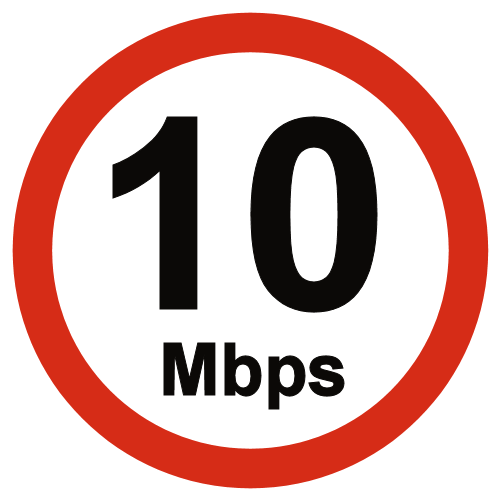 Ofcom believes that a speed of 10Mbps+ would be “sufficient to meet the current needs of a typical household,” but they recognise that different people and businesses need different things and so the regulator has chosen to provide advice based on a range of technical specifications (see below). • Scenario 3: a superfast broadband service, with download speeds of 30Mbit/s, upload of 6Mbit/s, latency (fast response times), a ‘committed information rate’ of 10Mbps and unlimited usage. Ofcom also views it as being “reasonable to assume” that implementation of the USO could start from the end of 2017. At that point, a smaller number of premises might require intervention to deliver decent broadband. Given a late 2017 start, the regulator suggests that the total USO cost is estimated to be between £1bn to deliver a standard broadband service to 1.1 million premises (scenario 1) and £1.7bn to deliver superfast broadband to 1.9 million premises (scenario 2). This is considerably more than the current USO, but the scale of the problem will also shrink with time thanks to the on-going BDUK deployment etc. The cost-per-premises of delivering decent broadband to the very hardest-to-reach premises could also be very high. Premises in the final 1% have an average cost that ranges from £2,780 per connection for standard broadband to £3,350 for superfast broadband. Meanwhile those in the final 0.5% can cost between £4,460 and £5,100. However the cost of serving the most expensive premises is estimated to be around £45,000 in all three of our scenarios and as a result Ofcom suggests that a Reasonable Cost Threshold (RCT) be introduced “to limit the upper bound of the costs“. We expected this proposal, particularly as the current USO already has something similar (see above). Ofcom estimates that a reasonable cost threshold of £5,000 per connection would leave between 30,000 and 38,000 premises left unserved in the standard broadband and superfast broadband scenarios respectively. On the other hand this would reduce estimated costs by £280m for standard broadband to £320m for superfast broadband. Alternatively, if, the policy was designed to cover 99.5% of UK premises, then 140,000 premises would remain unserved and potential costs would be reduced by £500m for standard broadband to £570m for superfast broadband. This offers a good indication of just how much difference a small change can make when looking at the final 1% or so of UK premises, which is why inferior Satellite is so attractive as a quick-fix. One big problem for the USO is that hardly any ISPs, other than BT and KCOM (Hull) in their respective markets, actually want to take part and it’s easy to see why from just looking at the costs and legal responsibility of it all. Ofcom notes that “no mobile or fixed wireless providers have come forward for designation as a USP to date” and “there is unlikely to be competition to deliver a broadband USO across the whole of the UK“. The next problem after this is technology choice and Ofcom notes that “one technology will be not be suitable for all circumstances“. On this front it’s noted that FTTC and FTTP based technologies would both be able to deliver the USO in all scenarios, even if FTTP is probably too expensive for the vast majority of areas, while Fixed Wireless and Mobile Broadband would work well for Scenario 1 + 2 and Satellite may only partially work for Scenario 1, but not Scenario 2 and 3 due to capacity and latency issues etc. Adopting Satellite into the USO, while perhaps inevitable for some extremely remote properties, may not go down well as many people do not want an inferior connection that cannot deliver low latency performance (necessary for most online multiplayer games and other cloud computing apps) or offer a flexible and affordable “unlimited” usage allowance. At present we know that Openreach (BT) are investigating the possibility of using Long Reach VDSL (FTTC) and normal FTTC to solve a big part of the USO problem (here), although LR-VDSL has plenty of challenges (details) and one of those is the need to withdraw existing ADSL services. The latter is a big headache for ISPs, particularly in those few areas where LLU providers may be present. Never the less Ofcom’s report seems to favour a mix of technologies, albeit one dominated by FTTC based solutions and that’s hardly a surprise given that BT is the major player, has a lot of the necessary infrastructure already in the ground and has also made a commitment to support the USO “without any further public funding” (here). Ofcom’s document proposes that the USO should include a Social Tariff for those who may otherwise struggle to afford a 10Mbps capable broadband connection, although they admit that “more work is required on how this is delivered to ensure effective targeting at those most in need.” As such the tariff idea is not fleshed out. The regulator also supports the view that any USO should be reviewed every few years and adapted as speed / technology improves, which is actually a point that was originally put forward by the Government’s initial consultation. This is important because a 10Mbps USO might fill the gap if it existed today, but by 2020 it will already be starting to look slow. Ofcom states that it “may also be necessary to introduce mechanisms to ensure investment in commercial networks is not undermined,” which reflects the fact that the related upgrades could make it even harder for rivals to build their own alternative networks. The regulator suggests that such restrictions could be set by policy choices and any USO would “need clear eligibility criteria to determine who can access it in order to reduce the risk of ‘overbuild’ of competitive networks.” Such criteria must also be easy for consumers to understand. Finally, the regulator may need to setup a special Universal Service Fund to help manage the USO costs and recovery, but they’d first need to consult on the specific design. Another big question mark is whether the USO should be truly “universal” (i.e. anybody in the UK can benefit) or if it should only apply to those deemed to be eligible (e.g. those living in a known sub-10Mbps area). “As an industry, we understand the frustrations of those who still receive slow speeds. Our members have worked hard to reduce the number of premises with speeds of less than 10Mbps from 15% in 2014 to 5% today. However, reaching the final 5% requires significant additional investment, so ISPA supports a USO that sets out basic specifications around download and upload speed, contention and other technical details, whilst keeping the overall cost low. Ofcom’s research demonstrates that even a basic USO comes with significant costs of up to £1.1 billion that could result in household bills rising by £20. Potential impacts on competition could have further impacts on consumer bills so we will work with Government to ensure that the USO is cost effective and supports the competitive broadband market in the UK. Given the clear socio-economic benefits of broadband and increase in government services delivered online, Government should consider the use of public funding as well as a levy on industry. At this stage Ofcom does not attempt to set a chosen path and instead leaves the big decisions up to the Government. As a side note the regulator is also examining the prospect of a USO for Mobile Networks. I highly doubt the Government will go down that path 🙂 . The choice appears to be 1) go early and it will out of date before the law comes into force, all at an some enormous cost or 2) wait and we should be able to do better using existing resources. At the moment isn’t the debate hijacked by those for whom technology is everything and (it seems) money is no object? When you move to a USO, you have to carry the (much larger, majority) for whom, I suspect, money is everything and the technology subsidiary. When everything else is going up in cost too, and wages (and, increasingly, pensions) don’t automatically increase in excess of inflation (for most people, at least), that’s an important (if not vital) consideration. As are taxes. It all hits the normal public in the end. Money doesn’t grow on trees. The commentariat seem to think that the internet exists in some sort of comic book vacuum, insulated from the rest of life. It doesn’t. We want it, of course. That’s the easy bit. We want everyone else to pay for it. That’s the hard bit. Why must I use multiplayer gaming, 4K+ video and cloud computing, just because I can, apparently? Is it a substitute for eating and keeping warm in winter, or even having to meet the rest of the human race; ever going out, or something? Please tell us. It actually seems to me that the problem isn’t so much with the technology, which will inevitably improve over time, with or without Ofcom and the Government, though they might impede it; as with the content. I don’t see any evidence of the improvements in the technology bringing forward better content. Almost the reverse. Perhaps life was always a triumph of hope over expectation, though. We know the conundrum is that those who want it most desperately are always in the locations where they can’t get it. It seems to me that the USO is probably the most inefficient way that could be devised of dealing with that problem. But, of course, that has never stopped us yet. The government could spend the obscene squillions it is preparing to throw at nuclear missiles on communications infrastructure. If and when we get invaded by ‘teh Яussians’ we would all be well aware of what was happening due to our superior technology and we could run and hide until such a time the danger had passed and we could once again pay taxes to the ‘correct’ people. I’m sure there are some isolated places where the cost of getting fibre to is prohibitive but I’m equally convinced that a lot of premises are just too few for the providers to be bothered. It is not a question that the technology isn’t available or even difficult to implement just not viable for the revenue that will be generated. How did the GPO manage to get a telephone line to my house 50 years ago but today its not possible to get fibre.